JEEP CHEROKEE LIMITED 2015 4X4, 70 387 KM, ROUGE, AUTOMATIQUE, CUIR, GPS, SIÈGE CHAUFFANT, VOLANT CHAUFFANT, DÉMARREUR À DISTANCE, DÉMARRAGE SANS CLÉ, CAMÉRA DE RECUL, BLUETHOOT, GROUPE REMORQUAGE ET BIEN PLUS ENCORE. POUR SEULEMENT 85.29$/ SEMAINE SANS AUCUN COMPTANT NI SURPRISE À LA LIVRAISON CE MAGNIFIQUE JEEP EST À VOUS. 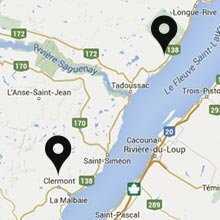 NE TARDEZ PAS ET PASSER CHEZ CLERMONT CHRYSLER POUR VENIR EN FAIRE L'ESSAI AUPRÈS DE NOTRE ÉQUIPE DES VENTES. Ce véhicule, Jeep Cherokee Limited * CUIR vous intéresse?